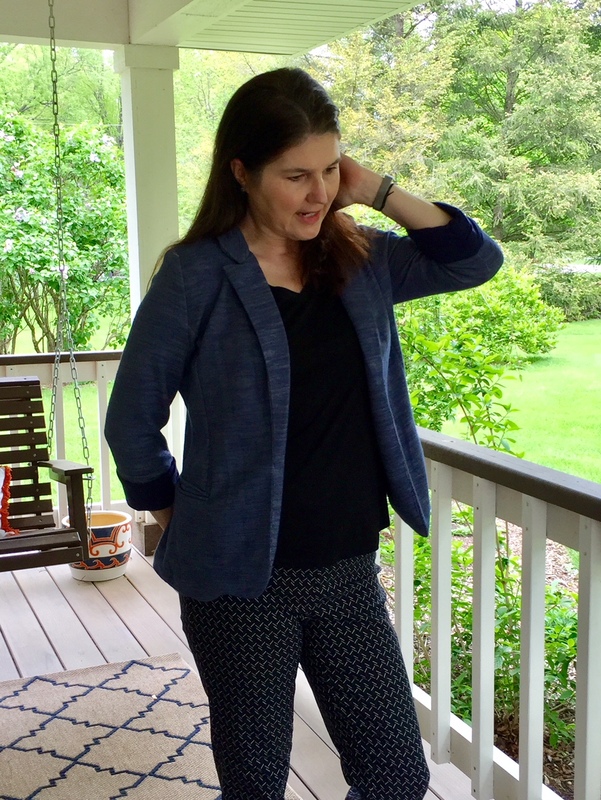 Before I get to my Stitch Fix review for this month, I want to extend a sincere thank you to everyone who has liked, commented or emailed me kind words about these reviews. I view this website as my digital scrapbook, and the idea that other people enjoy reading it brings me enormous joy. 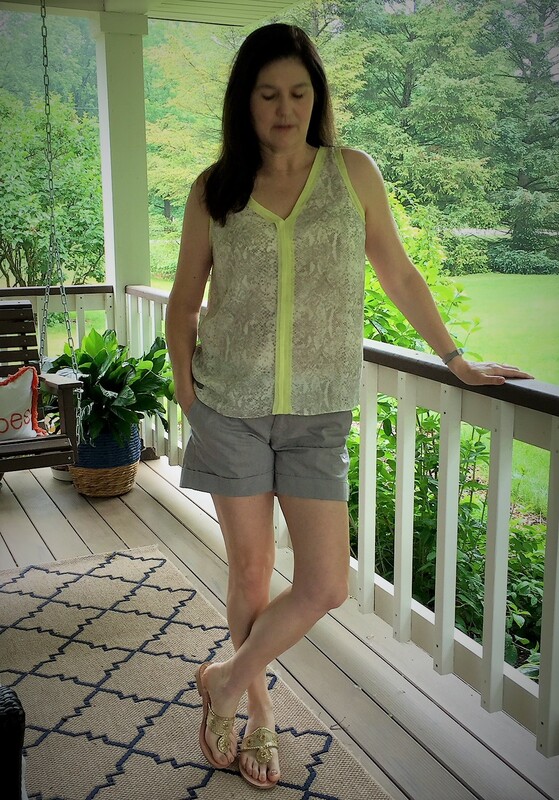 Alright, enough with the mushiness of emotion, let’s talk about my obsession with Stitch Fix. 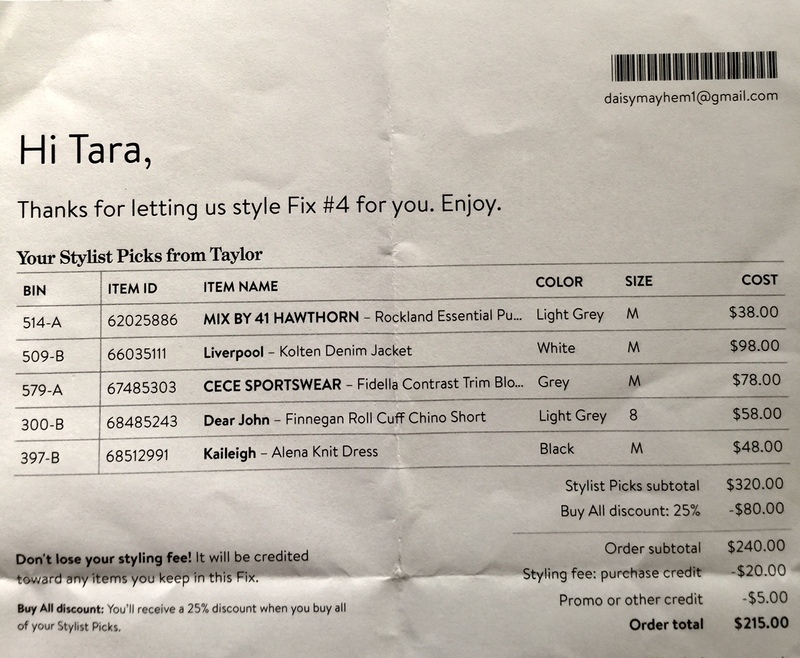 For those of you have just stumbled onto my site and have no idea what I am talking about, Stitch Fix is a subscription styling service, that, for a reasonable fee, sends you items based on a profile you create. 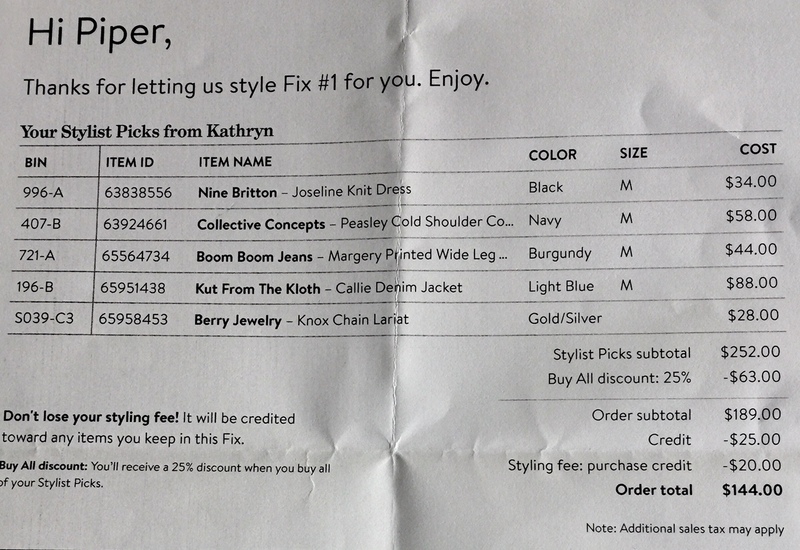 If you choose to purchase an item, the styling fee ($20) is credited towards your balance. You can also get a $25 credit if you use a referral link when you set up your profile. If you are interested in trying this, just follow the link below and fill out your profile. When you are ready to order your first Fix, you will have a $25 credit waiting for you on your account. So let’s get to it, June’s Fix has some great stuff to share. This month I had the same stylist, Taylor, and she seems to get that I like classic, versatile pieces. I asked her to be on the lookout for shorts, summer sweaters or jackets, a dress or skirt and NO ROMPERS! For the love of all that is good and holy, NO ROMPERS!!! Let’s take a look at what I got. First up, is this eye-catching blouse and about the most versatile pair of chino shorts one can imagine. I love both of these pieces, they are exactly what I ask for, however what I did not like were the prices. The Fidella Contrast Trim Blouse by CeCe Sportswear was $73, and the Finnegan Roll Cuff Chino Short by Dear John was $58.00. YIKES!!! 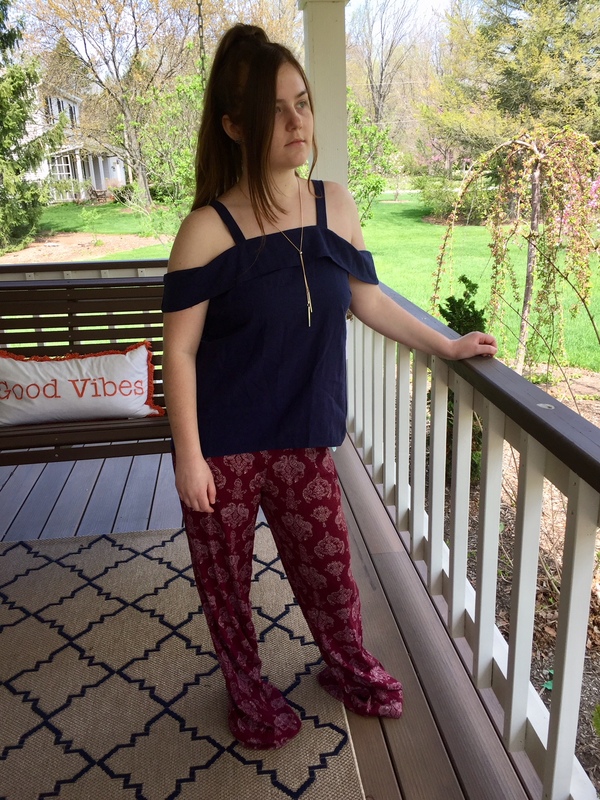 Unfortunately, I fell in love with the blouse when I took it out of the box, immediately decided it was new best friend and was already imagining all of the adventures we would have before I saw the price. Having never paid more than $30 for a pair of shorts I was curious as to what $50 shorts felt like. Well let me tell you, it was enlightening. 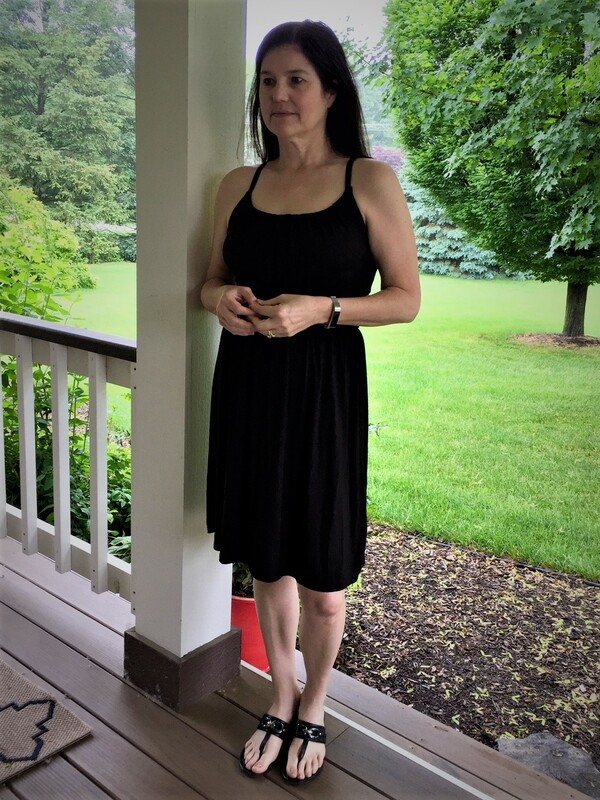 First, it has 2 big hook and eye closures and an internal button, fancy, And, the waist band has this stretchy quality I cannot identify, but lays flat and is very comfortable. Finally, they don’t ride up your backside every time you sit down, so you have to discreetly remove them as you stand. I’m not sure what kind of witchcraft this is, but I’m smitten. 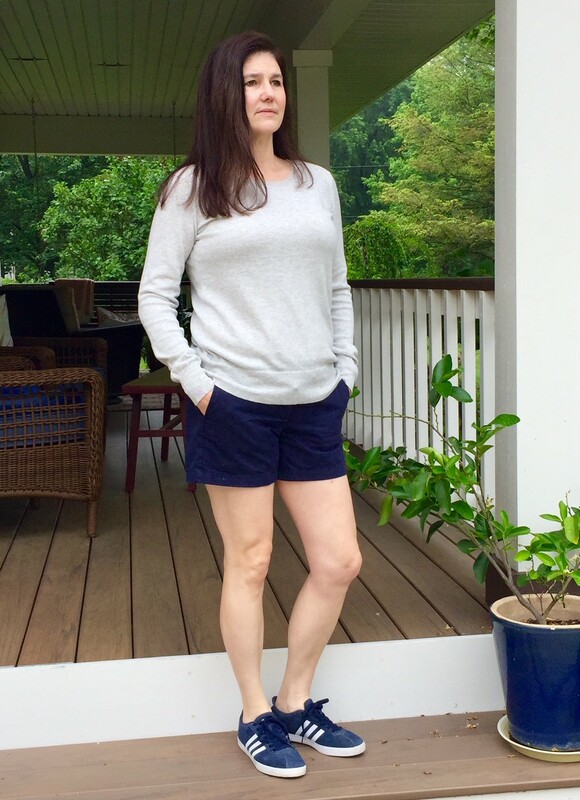 Next, was a soft as a whisper, light gray sweater called the Rockland Essential Pullover. 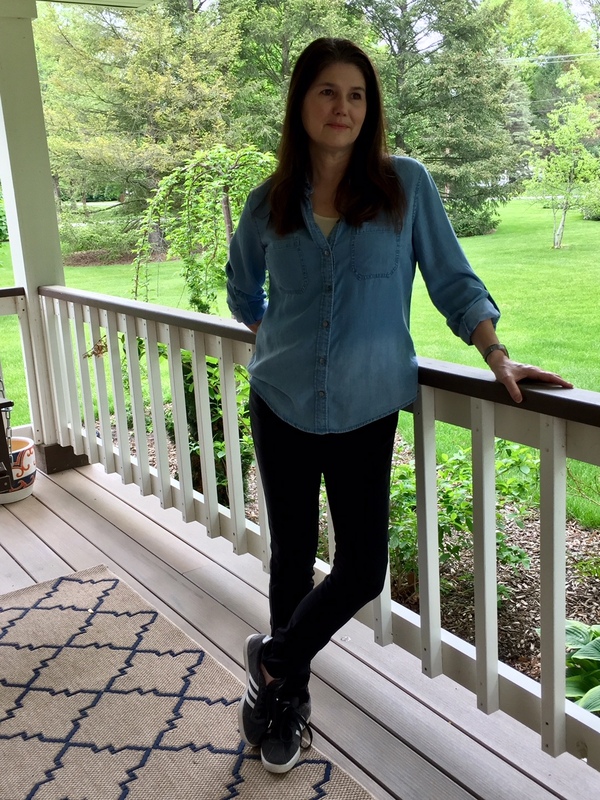 It’s basic, a bit boring and absolutely what I love to wear and at $38.00 it was reasonably priced as well. Then there’s this guy, the Kolten Denim Jacket by Liverpool. 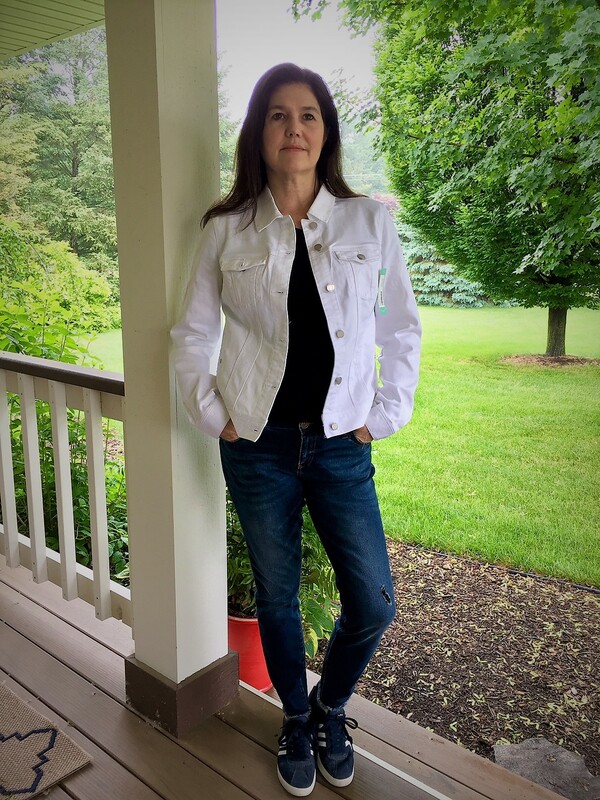 I had never heard of Liverpool until Stitch Fix, and I have to say their quality is fantastic. However, their prices will make you wince. 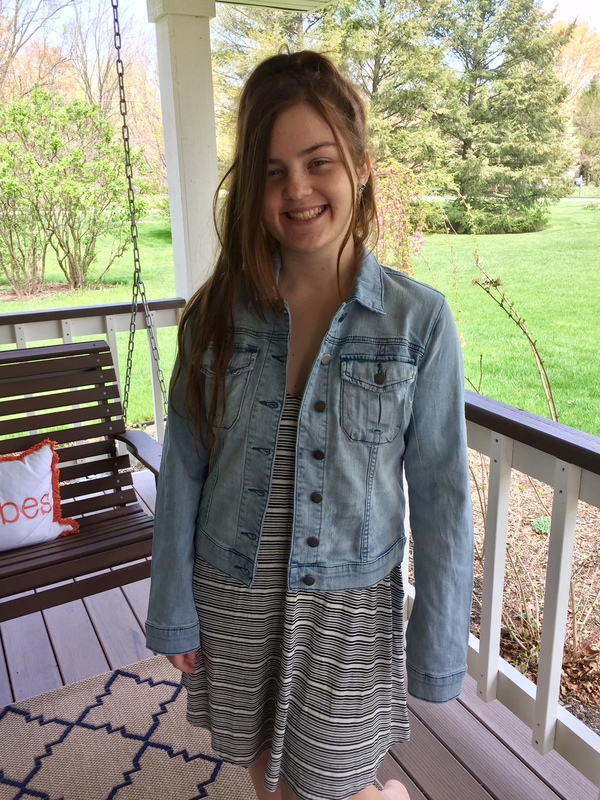 This jacket was a whopping $98. YIKES squared! So here’s the thing about me and white denim anything, we are not good partners. You see, I’m a spiller by nature, I also bump into and sit in things without realizing it. White denim is persnickety, and does not cotton to such behavior. It will punish you harshly and expose you to public ridicule for such transgressions. Therefore, Kolten the jacket and I are not destined to be soulmates. But, if I were ever able to love a white denim jacket, he would be the one. Finally, this little beauty. The Alena Knit Dress by Kaileigh ($48.00). Generally, I do not like narrow straps on anything, I have really broad shoulders and I think they make me look like a 1980’s East German weightlifter. 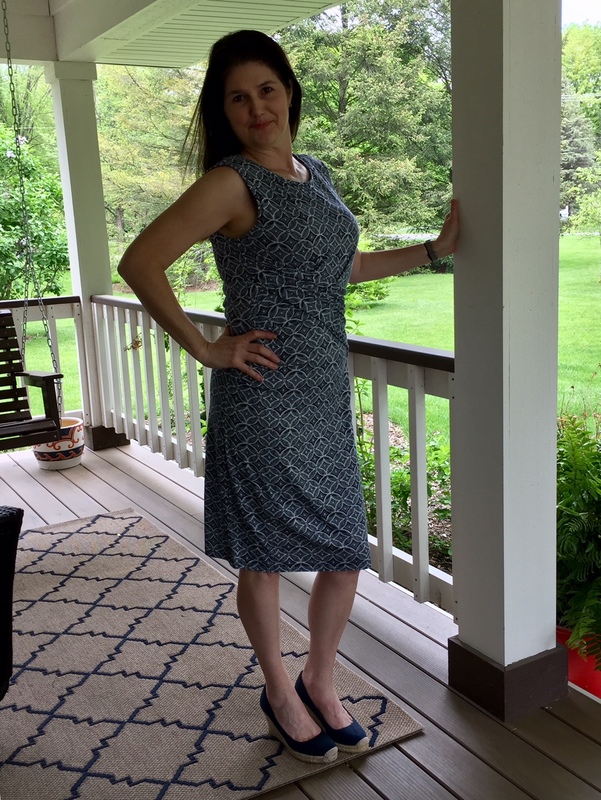 But, somehow I don’t feel that way about this dress, the fabric is so soft, and the length is so perfect I am willing to work with the straps. So what’s the damage, I’m afraid to look. Hmmmmm… So what I’m hearing is if I buy them all I will get $80 off? Interesting. That’s basically getting the dress and the sweater for free. Let the rationalizing begin. 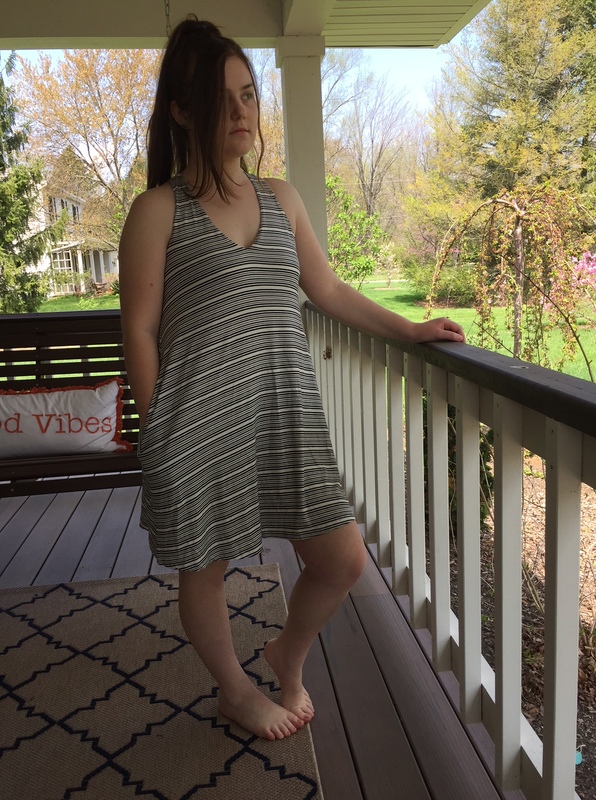 I have heard tell of a Facebook group where you can buy, sell and trade Stitch Fix clothing so I may check that out. In a perfect world, I would be able to sell the jacket and then keep all the other items and the discount. I believe a little research is in order, I still have a couple days to decide, I will keep you posted on what I end up doing. 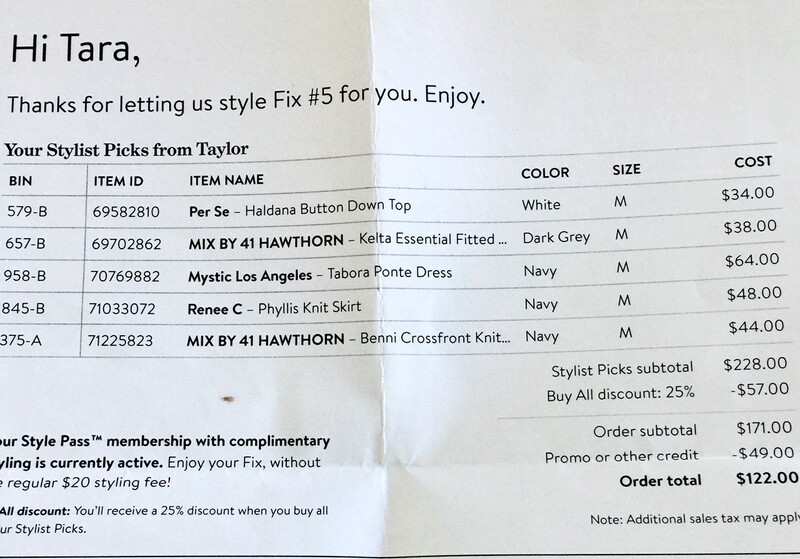 If after reading this post, you think you might like to have your own Stitch Fix adventure, please be sure to use a referral code, even if it isn’t mine. Don’t be a fool like me and get so excited you go right to the site and sign up. That $25 credit comes in really handy when you are trying to decide what you can afford to keep. You can click through the link below and set up your profile, but you don’t have to schedule a fix until you are ready. Have Fun!